Seriously, just like taters ya’ll. 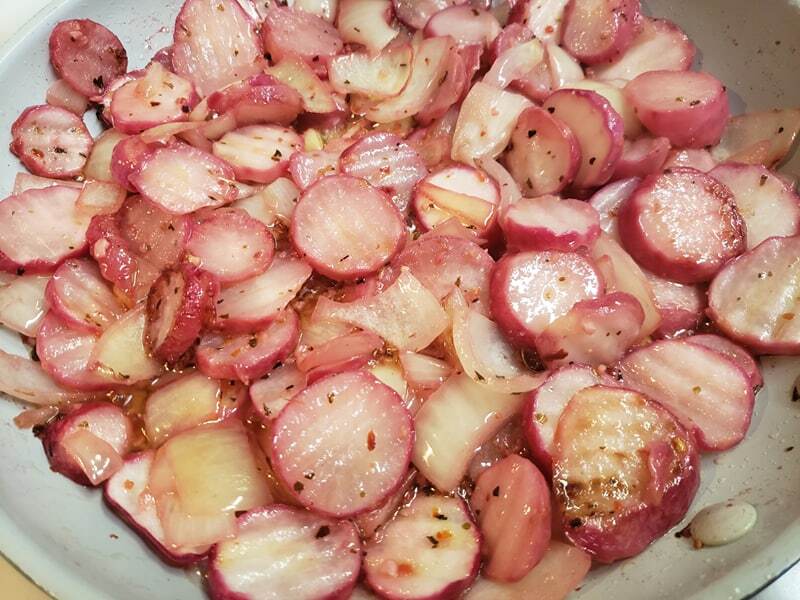 When my sister-n-law messaged me a pic of her sauteed radishes and said they tasted just like taters… I didn’t believe her and had to put it to the test. We are from the South and “taters” were a piece of life that was missing with keto living. Not anymore! Since then we have tried them in our Keto Thyme Chicken Veggie Soup and in our campfire foil pouches. Seriously, they are just like having potatoes. The trick to taking the heat out of the radishes is to saute them for a looong time. I am talking, to the point of browning in the skillet. 1. Wash and dry radishes. 2. Cut off the ends and dice with a veggie crinkle cutter. 3. Heat 3-4 tbsp of avocado oil in a large skillet. 4. Once oil is hot, add radishes into skillet. 5. Optional: dice 1/2 an onion and drop into skillet. 6. Add seasoning of choice- we used Pink Himalayan Salt and Herb Blend and pepper. 7. Cook on medium heat until radishes are tender. 8. Remove from heat, add as a side to your favorite protein meal and enjoy.